Con O'Callaghan came of age as a Dublin senior footballer with a dozen points at Croke Park as Jim Gavin's men secured a remarkable seven Leinster titles in a row. A brilliant start and a strong second-half performance combined to secure the landmark win for the back-to-back All-Ireland champions. A whopping 66,734 turned out for the contest and Kildare hinted during a strong second-quarter performance that saw them cut a nine-point deficit to just four that they may cause a shock. But they were no match for the pace, power and finishing ability of Dublin in that second-half and O'Callaghan shone brightest among their galaxy of star finishers. The Cuala man, an All-Ireland U-21 and club hurling medallist earlier this year, took over the free-taking duties after goalscorer Dean Rock's 24th-minute black card but delivered in general play too, kicking six from play. Ciaran Kilkenny had another strong game for Dublin too while James McCarthy scored their other goal and Bernard Brogan sniped five points after replacing Rock. It's just the second time in 15 Leinster championship games under Jim Gavin that Dublin haven't won by at least 10 points so Kildare can take some positives from the defeat. They will fancy their chances of progressing in a final round All-Ireland qualifier while Dublin advance to an All-Ireland quarter-final on August 5. Kildare came to Croke Park burdened by a terrible record at the Jones Road venue having won just five of their previous 20 league and Championship games there. Their most recent defeat there came against Galway in the Division 2 league final while they suffered high-profile defeats to Clare and Westmeath in 2016. Their Croke Park record against Dublin specifically was dismal too with a whopping 56 points between the teams in their previous four meetings at GAA headquarters. So when Dublin roared into that 2-03 to 0-01 lead after just 11 minutes it looked ominous to say the least for Cian O'Neill's side. Dublin's minors had led by the exact same scoreline early in their big final win over Louth in the preceding game and it looked as if the seniors might be destined for a large victory also. Paul Mannion, Kilkenny and O'Callaghan were all on the mark with points before Kilkenny picked out the onrushing Rock with a clever fist pass and the Ballymun man slotted low to the left corner. Moments later Kilkenny was on the attack again and played a neat one-two with James McCarthy who got cut inside his man and slid a low shot beneath Mark Donnellan in the Kildare goals. O'Callaghan's second point in the 18th minute put Dublin 2-04 to 0-01 and it was looking like predictions of another double digit winning margin for the holders was spot on. 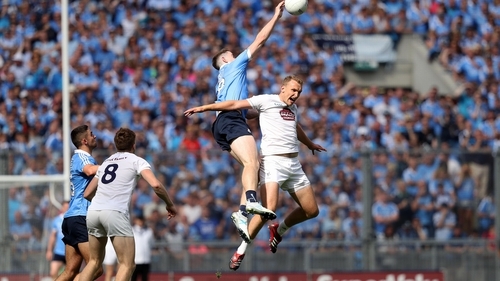 Kildare's response was terrific though and they opened up with some stunning football before half-time, outscoring Dublin by 0-09 to 0-04 to haul themselves right back into the contest. It was a four-in-a-row of points from Cathal McNally, 2, Keith Cribbin and Kevin Feely that begun the fight-back and suddenly Kildare had found some momentum. Defender Johnny Byrne burst upfield for another Kildare score and ex-soccer professional Feely closed out the half with a great point from long range to leave Dublin just 2-08 to 0-10 ahead. But Dublin were at their free flowing best in the third quarter and began to put serious daylight between the teams again with a flurry of points. Paddy Andrews, Brogan, O'Callaghan and Kilkenny all split the posts as Dublin ran 2-17 to 0-12 clear. Kildare were overwhelmed at times but finished strong with points from Feely, who was eventually black carded, Fionn Dowling and Paddy Brophy before the latter fired in a consolation injury-time goal. Dublin: S Cluxton; P McMahon, C O'Sullivan, M Fitzsimons; E Lowndes, J Small, J McCaffrey; J McCarthy (1-00), B Fenton; C O'Callaghan (0-12, 0-06f), C Kilkenny (0-02), N Scully; P Mannion (0-01), P Andrews (0-01), D Rock (1-0). Subs: B Brogan (0-05) for Rock (24, black card), S Carthy (0-01) for Scully (47), D Daly for McMahon (48), K McManamon for Andrews (51), D Byrne for O'Sullivan (58), B Howard (0-01) for Fenton (67). Kildare: M Donnellan; M O'Grady, O Lyons, D Hyland; K Cribbin (0-01), E Doyle, J Byrne (0-01); K Feely (0-05, 0-04f), T Moolick; D Slattery (0-01), N Kelly (0-01), F Conway; C McNally (0-02), D Flynn (0-02), P Brophy (1-03, 0-01f). Subs: P Cribbin for Conway (44), F Dowling (0-01) for Moolick (49), P Kelly for Doyle (52), B McCormack for McNally (57), E Bolton for Byrne (63), E Callaghan for Feely (64, black card).